In September of last year I wrote an entry celebrating the indie rock band Rilo Kiley, with a top-ten list of some of my favorite songs (Rilo Kiley = Awesomeness). The list and albums are below. 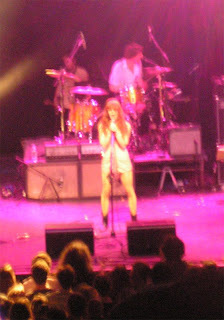 I saw Rilo Kiley in concert for the first time last year at Terminal 5 in NYC where I took the really crappy picture to the left. My digital camera at the time, the Olympus D-595, really sucked at taking photos in low-lighting without the flash, and it was actually the extreme disappointment of failing to capture my favorite band live that prompted an investment in the sublime Nikon D80 Digital SLR. Beautiful, isn't it? Now I just have to wait for their next NYC concert so I can take some real photographs. It's been more than six months since I was blown away their Terminal 5 performance, and since then, my obsession has grown. Their quirky lyrics and mellow musical stylings are perfect for my daily subway commutes and for looping on my iPhone during a long work week of data entry and graphic design. I now own all of their CDs (with the exception of The Initial Friend, which is hard to come by), and my top-ten changes daily as their songs speak to me differently depending on my mood and state of mind. Which is why I must amend my original list by tacking on 15 more top songs, finally giving Take Offs and Landings the recognition it deserves. How do you do it and make it seem effortless?